2 unique sample-based SyncGrain oscillators (SGOs). Additional Sub Oscillator, based on SyncGrain's spectral content. A ring modulator for each voice, based on the Sub Oscillator. Dynamic routing of the signal into a 'powered by Quad Frohmage' filter bank, with loads of filter types, distortion, band delay and much more. Extensive modulation options (one LFO + one xADSR per parameter + MIDI) for almost every parameter. Over 100 Meta-Patches included, each one containing 12 patches, so it means 1200 patches ready to use. Create a morphing oscillator out of any sample or waveform, and even use multi-samples to create drum kits. 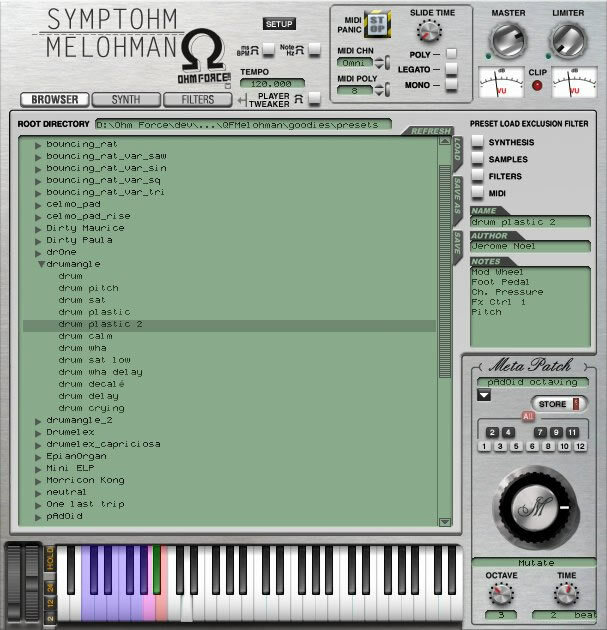 In depth sequencing : pattern controlled sound driven by the Melohman keyboard. Create a morphing oscillator out of any sample, and even use multi-samples to create drum kits. Useful presets instant variable transitions where all the parameters switch from the old value to the new one "in a ballet you won't forget". MIDI automation: allows control of all parameters from any MIDI source and records its movements. With the MIDI feature, it's also possible to adjust the LFO phase to get accurate tempo synchronization and to obtain totally musical and rhythmic effects. All RPN and NRPN data sent or recorded are 14-bit accurate. (1) It takes a static picture of a sound and breathes life into it. You can twist and pull and wrench and turn that sound over and under, backwards and forwards. The results are full and rich *and* clear and penetrating, and, most of all, musical. It does bread and btter with the same ease as deep fried peyote muffins. (2) It introduces both a new form of synthesis and the Melohman technology. So it's innovative, too, something that immediately differentiates it from 99% of the plug-ins out there. And these innovations aren't just of the madly experimental sort, but are highly useable. Melohman, particularly, is aimed at players, not just tweakers, although it's a tweaker's delight, too. There's no other synth out there that can do these things: reason enough to buy it. (3) It has, in the funky skin, the nicest GUI I have ever seen. I love the fact that ohmforce covered it in strange drawings and weird victorian decoration. And more mad apes than you can shake a stick at. (4)Artistic merits aside, it's a clear and logical design: the signal flow is mapped onto the GUI itself. Which is handy given all the routing configurations. And as already mentioned, those knobs just ooze quality. (5) There's more modulations per square centimetre than any other synth I have ever used. Virtually every parameter can have it's own envelope and its own lfo. Adding modulations doesn't thin the sound out the way it does in so many plugins. (6) The filters sound really, really good. The quadfromage concept fits perfectly here. (7) Metapatches are also an excellent solution to a perennial problem: you create an excellent patch but you have to tweak it slightly for different tracks. So you end up saving the same named preset all over the place. Metapatches centralise this and allwo you to switch easily between variations. (8) Ohmforce support is among the best in the business. What don't I like, then? To be honest, not too much. The are elements on the GUI that could be easier to read (a few too many shades of grey in places) but once you know what they do it doesn't matter. 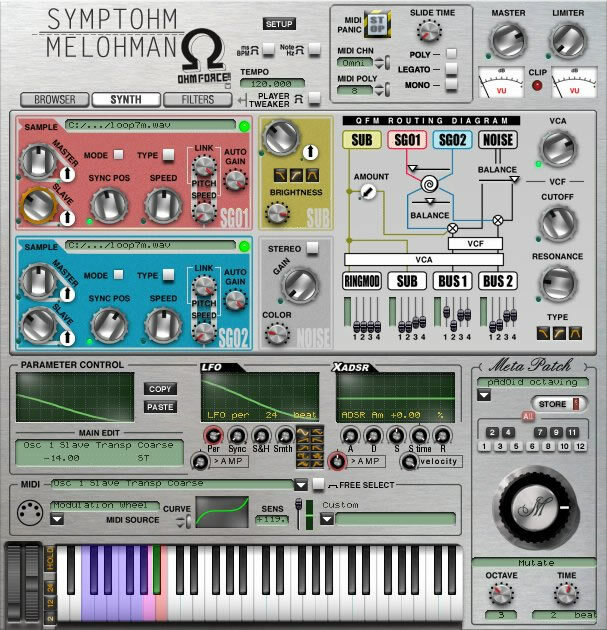 The multiple levels of modulation and routing could be confusing for a newcomer, but then you don't have to use these features to their fullest: Symptohm functions very well as a rwo oscillator single filter synth. Mising features? I'd like to be able to modulate the modulators, and modulate the filters using the oscillators as well. The documentation is clear if a bit on the brief side. A tutorial would be helpful for the less experienced user, particularly regarding routing. 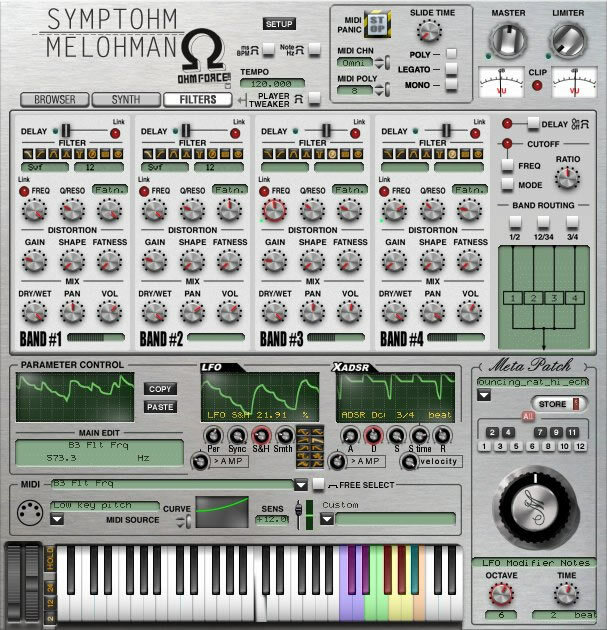 After about four hours of fiddling around with this beast I've come to the conclusion that Melohman: Symptohm is one of the finest synthesizers ever created in software. In fact, if it was a hardware unit I think it might sell big. What makes it so special? The pure musicality, tweakability and playability makes it stand out from it's competition. The meta patch concept that allows you to morph patches smoothly, or instantly, from one another via the normal MIDI keys is just ingenious! One of those rare "how come nobody else thought about this?" things. Another favourite feature of Symptohm is the super flexible per parameter midi scaling (yes PER PARAMTER!! ), envelope and LFO. This makes the synth very intuitive to use and extremely flexible. The only shortcoming is that all those Enevlopes and LFO's for the parameters can't be modulated themselves in any way except automation maybe. This is not a big issue though as usually only fully modular designs or synths with complex modulation matrixes let you do this. 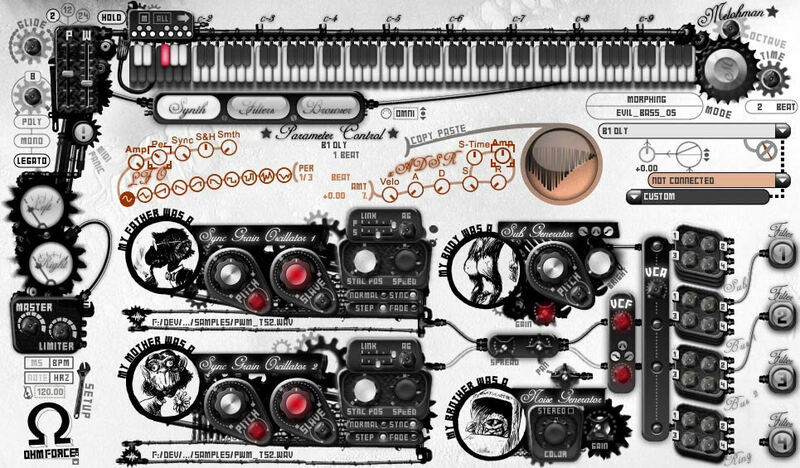 The two oscialltors are some kind of granular synthesis things that can take any sample and turn it into something completely different. It usually takes very little time to get some satisfying results from even simple short samples. You can even import your own samples while still keeping the preset settings on all the knobs and buttons so you don't need to start programming from scratch. I guess it's done to encourage the user to try out a lot of different samples for crazy sounds. 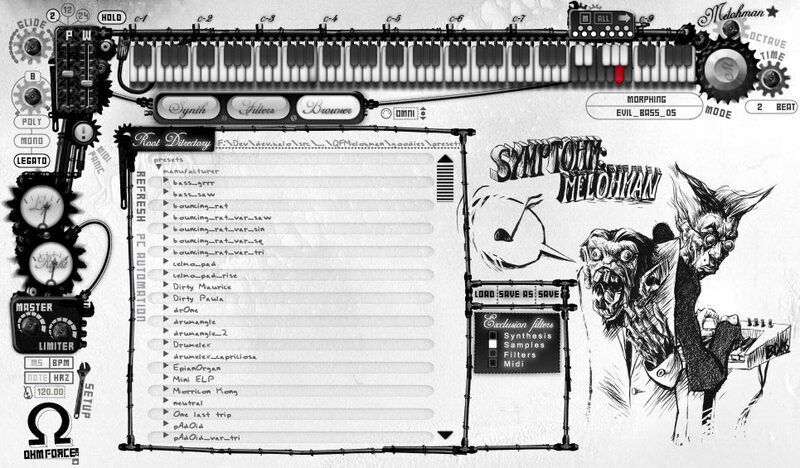 Symptohm is not just a "crazy swirling distorted multilayered pad" kind of synth, no, it's a highly playable subtle instrument with immense character. The way you can make nearly every knob respond to velocity, pitch (hi and lo key too), any midi CC, mod wheel etc. guarantees that it's always going to be a dream to play live. It can also make those same old boring wannabe 303 and phat trance sounds if you need to but hey, if that's all you need then, well, let's say that you're just a waste of the Melohman's time. Deep, challenging but still intuitive programming possibilities. Rich sound and highly playable. Beautifully rendered GUI with the highest quality virtual knobs and buttons that you can find anywhere and for the money the Ohmies are asking, it's a bargain!